Mark James Wilson, 37, from Eastwood Drive Broughton, Brigg, has pleaded guilty to assaulting a man at Normandby Rise, Claxby. A restraining order was imposed and Wilson was ordered to pay £50 compensation, fined £150, ordered to pay £85 costs and a £20 victim surcharge. Danielle Curzon, 31, has been found guilty of having a dog which was dangerously out of control in a public place in Willingham Road, Market Rasen. Lincoln Magistrates’ Court granted unconditional bail until January 14 for a pre-sentence report to be prepared. Shannon Alice Roberts, 19, of Cliff Court, Welton, appeared at Lincoln Magistrates’ Court on December 19 and admitted breaching a community order by failing to attend supervision between October 7 and October 21. Five days compliance activity has been added to the original community order in light of the breach. Harley Newland, 22, of River View, Mill Lane, Brigg, will appear at Grimsby Crown Court on Monday January 12 at 10am charged with robbery, two counts of Section 18 grievous bodily harm with intent and possession of an imitation firearm. He was remanded in custody when he appeared at Scunthorpe Magistrates’ Court on Tuesday December 29. A 27-year-old woman arrested has been released on police bail and a 36-year-old man earlier arrested in connection with the incident remain on police bail. The elderly couple involved in the alleged robbery remain in hospital. Ashley Richard Mappin, 31, from Sheffield, appeared at Lincoln Magistrates’ Court on December 26, charged with beating a woman in Union Street, Market Rasen. He was also charged with failing to surrender having been given bail by Sheffield Magistrates’ Court in November 2013. He was remanded on bail on the condition he does not enter Union Street, to appear at Lincoln Magistrates’ Court for sentencing on January 20. Samuel Rhys Snell, 20, of Waverley Court, Market Rasen, appeared at Lincoln Magistrates’ Court on Tuesday December 30 charged with trespassing at 16 properties in Lincoln between March and May 2014 with the intent to steal together with Daniel Westhead and Jordon Sutherland. He has been remanded on bail for trial at Lincoln Crown Court on Tuesday January 13. Ian James Speirs, 46, of Thorpe Lane, Tealby, has been jailed for 20 weeks after pleading guilty to drink driving at Lincoln Magistrates’ Court. He was jailed as this is his third offence within three years, had already been banned from driving and had made deliberate attempts to evade detection. He was also ordered to pay an £80 victim surcharge. Annette Elizabeth Chafer, 61, of Thorton-le-Moor, has been fined £500 and banned from driving for 18 months after pleading guilty to drink driving at Scunthorpe Magistrates’ Court on Wednesday December 31. She was also ordered to pay £85 costs ad a £50 victim surcharge. A warrant for the arrest of Matthew Teanby, 41, of College Yard, Brigg, was made after he failed to appear at Scunthorpe Magistrates’ Court on Wednesday December 31 to answer two charges of theft. 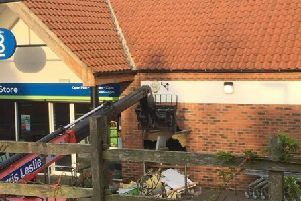 Mark Daniel Olley, 30, of Mill Lane, Brigg, appeared at Scunthorpe Magistrates’ Court on Friday, January 2, having already pleaded guilty to three counts of theft from Boots and Wilkinsons. He has been remanded on bail until January 23 for a pre-sentence report to be compiled. He is not to enter any Boots or Wilkinsons store in Brigg or Scunthorpe.